At one point in the process, beta testers felt the feature was too overcomplicated. But after simplifying it, the experience really shines, he says. “The other day I made a favourites list, handed it to my wife and she was able to get a $120 basket together in four minutes for a great camping weekend with my girls,” he says. 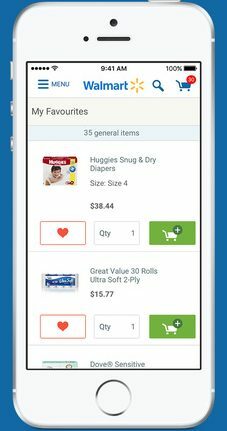 Released on Wednesday for iOS and Android, Walmart’s Online Shopping app was built through a collaboration with Razorfish Canada. It was developed based on a Canada-wide survey probing what people wanted from a Walmart app. It was also beta-tested by hand-picked customers and the retailer’s employee base as the final version was ironed out. But perhaps most notably, it comes at a time when Walmart’s reached a tipping point. Up until last month, most web traffic was coming from desktop users, Neuman says. But in June, mobile-based traffic overtook it. Walmart Online Shopping lets users compile a favourites list. With more than 400 stores across Canada, the bulk of Walmart’s sales are still taking place at bricks-and-mortar locations. But offering a digital option to consumers is just part of doing business in today’s marketplace. “The whole definition of omnichannel is the realization that you can no longer, as the retailer, ask the customer to shop in one particular way,” Neuman says. The app also complements the website, which supports a responsive design for mobile users, by offering a more convenient channel to loyal customers, he adds. “The importance of mobile is becoming higher on our priority list,” he says. Aside from the favourites list, the app features weekly “flyer features” that are geo-located to the app user. If a favourite item goes on sale, the user can be notified with a Rollback Alert. In the Toronto area and Ottawa, customers can complete a shopping list on their app and book a time to pick it up in-store. 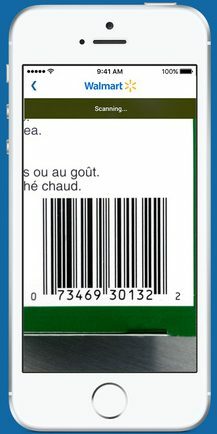 A barcode scanning app works in store to provide shoppers with more product information and user reviews and provides a price check. But even outside of the store, it has its applications, Neuman says. If you empty that box of Cheerios, scanning the bar code is a fast way to add it to your next shopping basket. Walmart developed the application with an agile methodology. While Razorfish focused on the front end, Walmart’s own in-house technology team did the work on the backend, leveraging the same infrastructure used to run Walmart.ca. A bar code scanner is useful in stores and in the home. Walmart has a technology team both in California that focuses on the Canadian market, as well as a local group that is based in Canada and identifies the features customers want to see. When it came time to beta test the app, many Walmart associates volunteered to help. As a result, the ‘accordion’ user experience aspect was cut in favour of a cleaner approach. Walmart.ca has become one of the top-trafficked retail sites in Canada, Neuman says, and its numbers compare well against even major media brands. The site services the same needs as a physical store, and in some cases even more – for example a store can only put five different patio sets on display, while there’s no limit to the number of sets shown online. While the retailer’s focus remains on setting low prices, digital convenience also ranks highly on Neuman’s list of favourite priorities.